This is my second time at this plein air festival. It was even better than the first time now that I knew the ropes. Sales were a little down but I did pretty well overall. One of my paintings even had a bidding war. 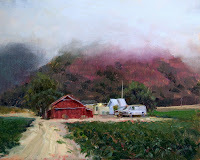 I woke up at about 6:00 am and the fog was crawling downhill over the farm of Mr. David Saari, where I was staying. I decided to capture that fleeting moment of quiet before the fog gets burned out. Luis Obispo is the closest one can be to Paradise as far as landscape, man-made or sea-made or otherwise. Remember: Don't wear white while painting outdoors. Wear sun lotion though.